This is the sign I made after listening to Jennifer’s inspiring interview. A little over a year ago I began this blog as a venue to develop and share thoughts close to my heart in relation to my pilgrim’s journey towards Christ and the Catholic Church. I use as inspiration that fact that at 21 years of age Christ radically changed my life and did it again 5 years ago when I entered into full communion with the Catholic Church. However, 6 months into my journey blogging at 21centurypilgrim.com and with only one well publicized post under my belt I experienced a drought in my spiritual life which affected my writing. To be honest – I wasn’t sure how to get out of the rut and begin writing again. It was about this time that I did two things. First, I signed up to attend the Catholic New Media Conference hosted by SQPN in Arlington, Texas. In addition, I listened to an interview by Brandon Vogt with Jennifer Fulwiler. It was during this interview that Jennifer was asked how she manages a house, 5 children and a relationship with her husband while writing (blogging) and speaking. Her answer was simple but transformative and exactly what I needed to hear. 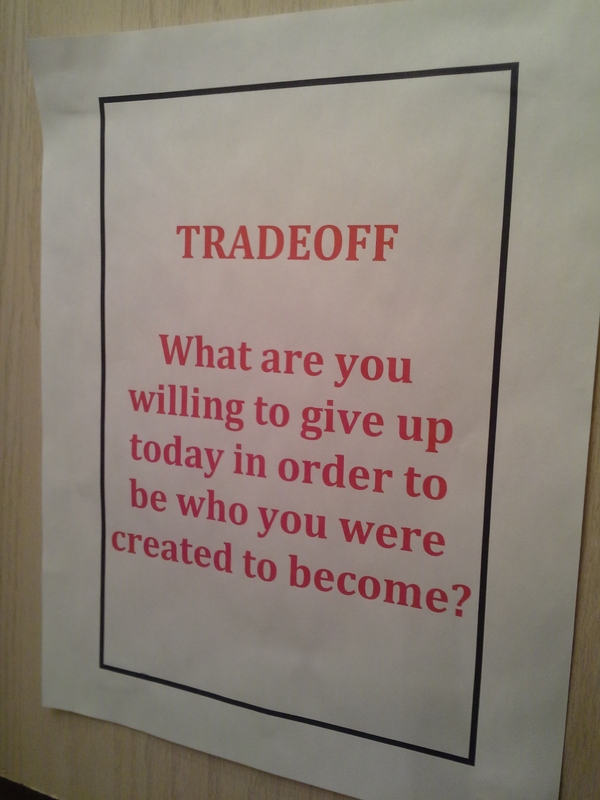 It’s about “trade-off’s!” What was I willing to give up today in order to do and become what I was created (or desired) to do? I made a sign (asking myself this question, “What was I willing to give up…”) and placed it on my bathroom mirror and on the door I exit everyday. I attended the Catholic New Media Conference, met with folks successfully navigating the blogosphere, listened attentively to the keynote speakers and personally thanked Jennifer Fulwiler (@conversiondiary) for her honest / thoughtful answers in that particular interview. What an inspiration! Since that time I found new inspiration and began blogging my thoughts more regularly. I have seen more of my posts publicized and my latest year-end report from Word Press stated that my blog had been viewed in 111 countries since Father’s Day 2012. A big thank you to the one that initially inspired me with her encouraging words – Jennifer Fulwiler. I share this story to make a point. Recently Jennifer has been hospitalized with a serious medical condition. In light of this condition, which has caused great suffering and uncertainty, I am committing to pray through a daily rosary on behalf of Jennifer and others who are suffering from severe medical conditions each day for the next week. I do this because Jennifer needs our prayers right now more than ever before as do others who are suffering. I do this because it is part of the faith that I believe and have hoped in now for over almost 20 years. I do this because Jesus calls us to action in the expression of our faith. He calls us to stand alongside those who suffer and give back to those who have so generously given to us. Jennifer has given so much, has inspired so many – its time to Pay (my share) It Forward on behalf of one who inspired me in the midst of a drought and doubt. Together we can make a difference. Commit with me to a reinvigorated prayer life in 2013 with a focus on those who suffer, are in pain (mentally, spiritually, physically) and those who have inspired us to live the faith we believe and profess. May God have mercy on Jennifer Fulwiler and others who are suffering. Join me and follow the pilgrims path! Inspiring article! As your wife, I have seen first hand you making choices to write, pray and think. . You have seized those previously lost moments and have written some wonderful pieces since creating these signs inspired by Jennifer Fulwiler. Whenever I see these signs hung on our bathroom mirror and also next to the door leading to the garage, I will pray for her as well. I will pray for Jennifer and for your continued inspirations…because they inspire me to the person Christ called me to be. Beautiful! Thank you for sharing your spiritual journey and the reminder to pray for Jennifer Fulwiler and others suffering. My mom has been in terrible pain for some time and is always an inspiration to me in how she patiently perseveres. God bless you and continue to guide your writing. Know that we are praying through the rosary on behalf of your mother. As fellow Catholic’s we must learn to suffer with those who suffer (on our knees & through the sacrifice of time). It should pain us when others are in pain – seeking the will of God for healing, understanding, and spiritual / metal restoration. May God grant you and your mother peace! Sounds like you’re finding that “spiritual rhythm”. Great blog post, Eric! Was the drought troublesome because it affected you writing about your spiritual life? Droughts, spiritual ones, are good, you know. sometimes I think many Catholic bloggers are living spiritually and intellectually toward the fourth wall. It was the type of drought that was blocking the flow. I do believe God used a difficult situation to help me go where I wasn’t able to on my own at that time. However, spiritual maturity develops in such a way that one goes more willingly as he / she matures.